So much of what we read, hear & watch brings us down. Life can “feel’ dark and dire, empty of hope. But every once in a while you run across something fresh and new and full of life. 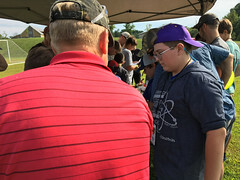 Last weekend’s Abba’s Way (Father’s Heart Weekend) for Dads and Son’s was a spark of renewal for me, and for about sixty other fathers and their boys. I came as a pastor-author-speaker, they as dads with their 6-12 year old sons. It was a beautiful time to be a part of, an honor and a privilege to watch as grown men took the time to focus 100% on their boys, from fishing and archery to capture the flag, boat rides, ropes courses, climbing, ice cream and everything in between, the ministry of Abba’s Way is making an impact that can be felt.